Download "Select One: New Delete Course Modification"
2 Description Credit will not be given for both and Contact Hours Max Activities Group Indiv Credit Enroll 1 st : 2 nd : 3 rd : Justification Additional resources or resource shifting required. If none, please explain. 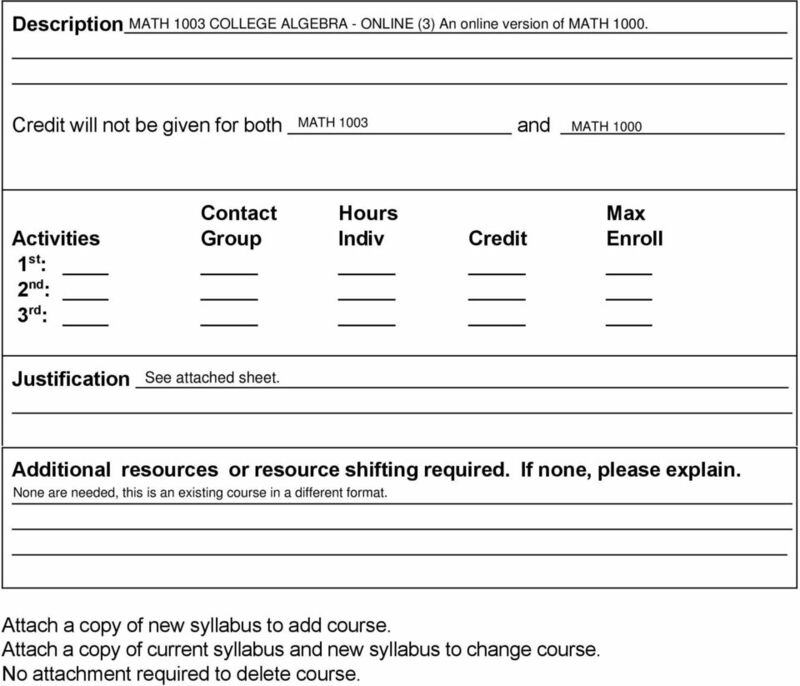 Attach a copy of new syllabus to add course. Attach a copy of current syllabus and new syllabus to change course. No attachment required to delete course. 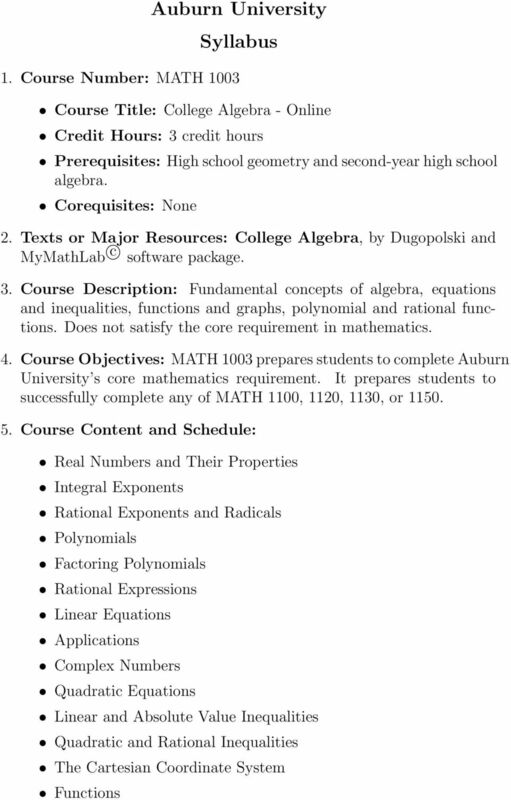 4 Justification Most students in College Algebra (MATH 1000) and Pre-Calculus Algebra (MATH 1120) courses fall into the following six categories: 1. New students who scored low on the Mathematics Placement Exam. 2. Students who are completing the basic Core Curriculum Requirement in Mathematics. 3. 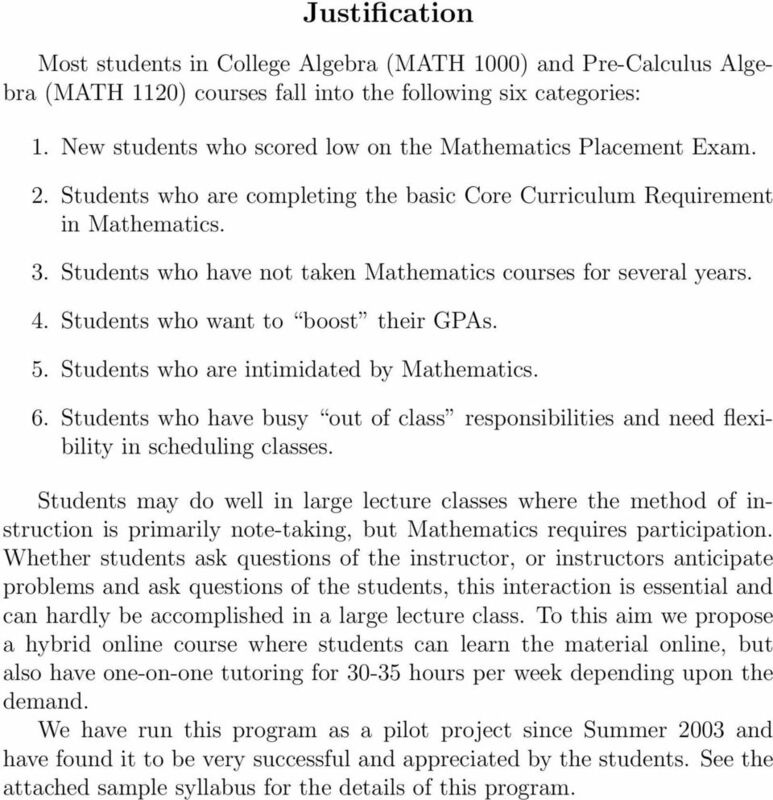 Students who have not taken Mathematics courses for several years. 4. Students who want to boost their GPAs. 5. Students who are intimidated by Mathematics. 6. Students who have busy out of class responsibilities and need flexibility in scheduling classes. Students may do well in large lecture classes where the method of instruction is primarily note-taking, but Mathematics requires participation. Whether students ask questions of the instructor, or instructors anticipate problems and ask questions of the students, this interaction is essential and can hardly be accomplished in a large lecture class. To this aim we propose a hybrid online course where students can learn the material online, but also have one-on-one tutoring for hours per week depending upon the demand. We have run this program as a pilot project since Summer 2003 and have found it to be very successful and appreciated by the students. 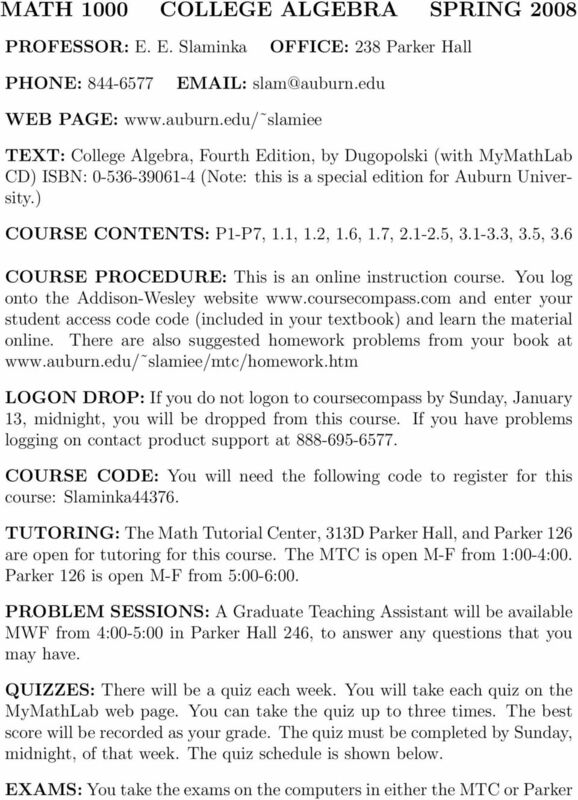 See the attached sample syllabus for the details of this program. 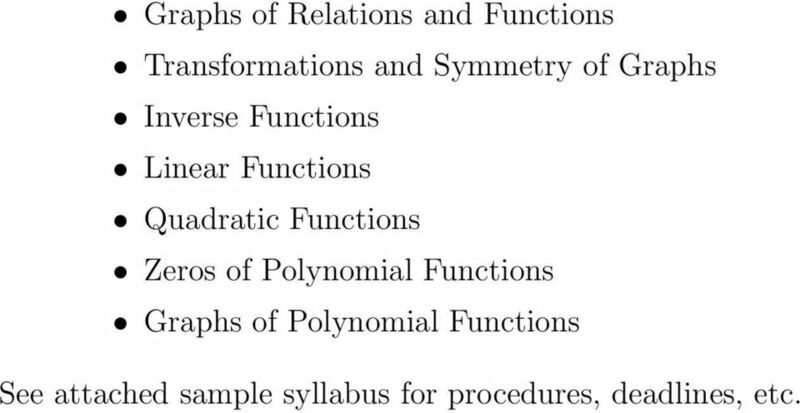 6 Graphs of Relations and Functions Transformations and Symmetry of Graphs Inverse Functions Linear Functions Quadratic Functions Zeros of Polynomial Functions Graphs of Polynomial Functions See attached sample syllabus for procedures, deadlines, etc. 8 126 (bring your university ID) by the deadlines listed below. Calculators are allowed on the exams. You are allowed one hour per exam (including the final exam). There are questions per exam. 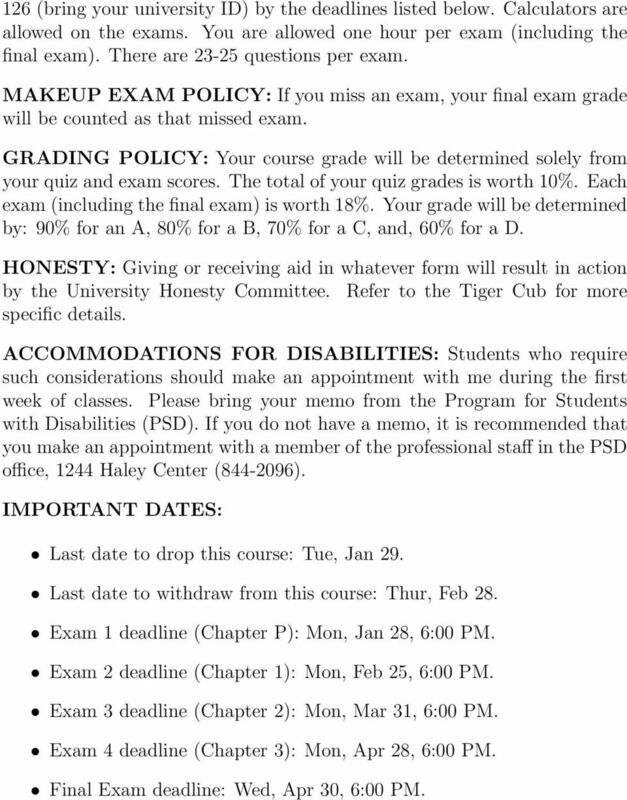 MAKEUP EXAM POLICY: If you miss an exam, your final exam grade will be counted as that missed exam. 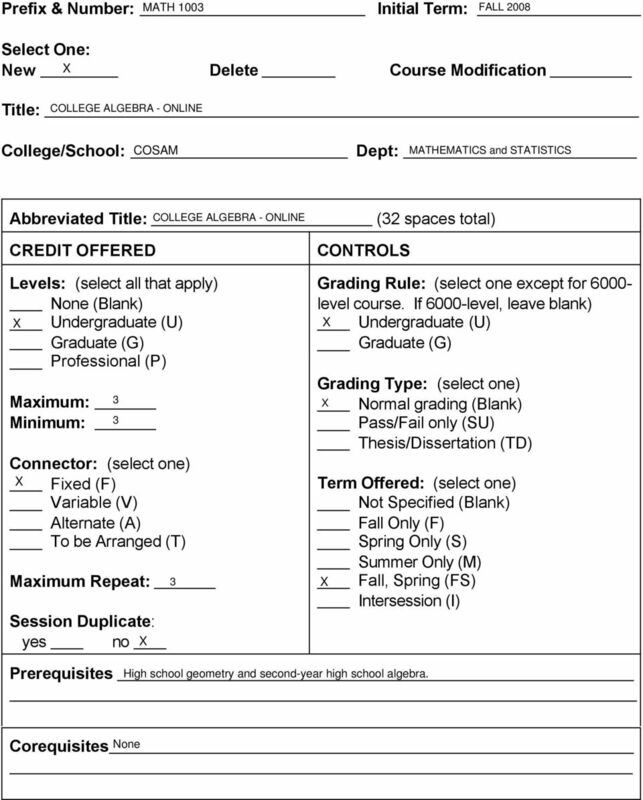 GRADING POLICY: Your course grade will be determined solely from your quiz and exam scores. The total of your quiz grades is worth 10%. Each exam (including the final exam) is worth 18%. Your grade will be determined by: 90% for an A, 80% for a B, 70% for a C, and, 60% for a D. HONESTY: Giving or receiving aid in whatever form will result in action by the University Honesty Committee. Refer to the Tiger Cub for more specific details. ACCOMMODATIONS FOR DISABILITIES: Students who require such considerations should make an appointment with me during the first week of classes. Please bring your memo from the Program for Students with Disabilities (PSD). 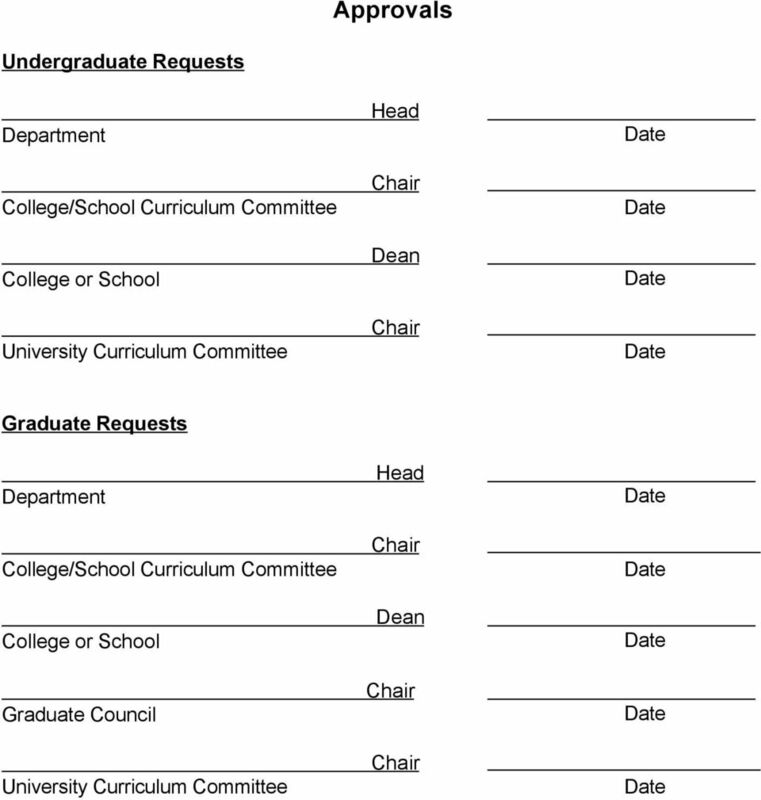 If you do not have a memo, it is recommended that you make an appointment with a member of the professional staff in the PSD office, 1244 Haley Center ( ). IMPORTANT DATES: Last date to drop this course: Tue, Jan 29. Last date to withdraw from this course: Thur, Feb 28. Exam 1 deadline (Chapter P): Mon, Jan 28, 6:00 PM. Exam 2 deadline (Chapter 1): Mon, Feb 25, 6:00 PM. Exam 3 deadline (Chapter 2): Mon, Mar 31, 6:00 PM. Exam 4 deadline (Chapter 3): Mon, Apr 28, 6:00 PM. Final Exam deadline: Wed, Apr 30, 6:00 PM.